Pancreatic cancer (PC) could be considered as a rare cause of cancer with an estimated 277,000 new cases diagnosed in 2008 throughout the world, which is equivalent to 2.5% of all forms of cancer. PC ranks as the fourth or fifth most frequent cause of cancer death in most developed countries because of its exceptionally high mortality. Although surgical resection is considered the main treatment mode for the disease, only 15%-20% of all PC patients are surgically resectable at the time of diagnosis. Furthermore, nearly two-thirds of diagnosed patients with resectable tumors develop local recurrence within 2 years of surgery. Application of radiotherapy and/or chemotherapy after resection may modestly improve the survival and quality-of-life in patients with advanced PC. Despite the number of extensive basic and clinical research studies that have been conducted thus far, however, the overall survival rate of the disease remains dismal. Five-year survival is less than 4%. Therefore, new and more effective therapeutic strategies for patients with PC are urgently needed. Over the last few decades, endoscopic ultrasound (EUS) has gradually become the mainstream method of the diagnosis and local treatment of PC. 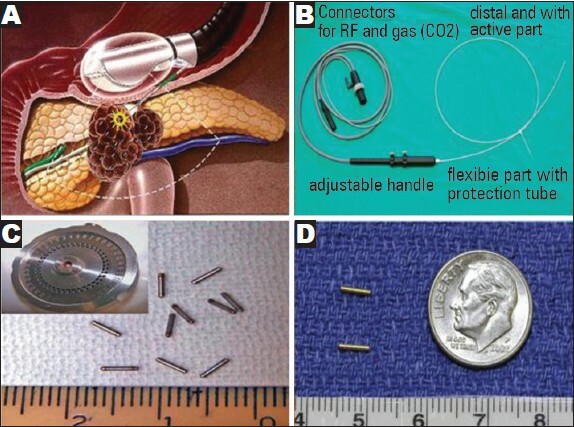 The development of linear-array therapeutic probes with large working channels has allowed EUS-guided intervention for pancreatic disease in various clinical situations and facilitated investigations of new procedures mainly involving the local control of PC. Compared with computed tomography (CT) or abdominal US-guided procedures, interventional EUS provides a more comprehensive real-time image and a shorter puncture pathway. As an anterior approach, EUS avoids the retrocrural space and may reduce risks of neurologic dysfunction and pulmonary complications. Current data demonstrate that EUS-guided fine-needle injection (EUS-FNI) is a feasible and safe procedure for treating PC. Interventional EUS includes antitumor agent delivery, radiofrequency ablation (RFA), photodynamic drugs, radioactive seeds, celiac neurolysis, fiducial markers and so on. 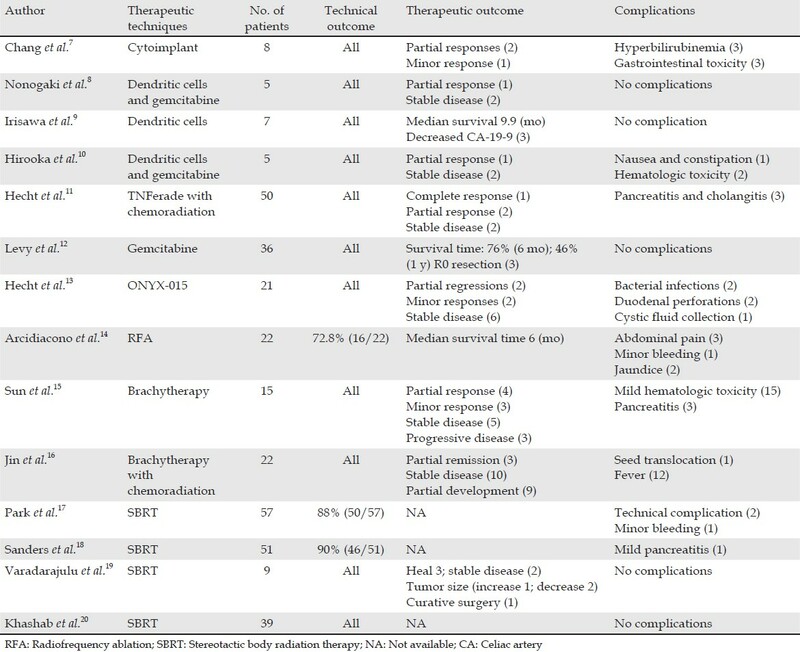 This review focuses on the utilization of interventional EUS for tumor ablation and pain relief from PC [Table 1]. Progressive knowledge on the function of the immune system in cancer surveillance and control has directed increased attention toward studies on immunotherapy [Table 2]. Chang et al. first reported a phase I trial of EUS-guided injection of an allogeneic mixed lymphocyte culture (cytoimplant) in eight patients with advanced PC. The cytoimplant was generated from a co-culture of healthy donor and patient peripheral blood mononuclear cells and could result in the release of cytokines and activation of immune effector cells. Escalating doses of 3 Χ 10 9 , 6 Χ 10 9 , or 9 Χ 10 9 cells were implanted into the pancreatic tumor by a single EUS-FNI. During the follow-up, three patients had transient Grade 3 gastrointestinal toxicities and three patients had transient episodes of hyperbilirubinemia. Low-grade fever that responded to acetaminophen occurred in seven of eight patients (86%). All fever was resolved within the first 4 weeks of treatment. The median survival was 13.2 months, with two partial responses and one minor response. Nonogaki et al. reported the first abstract for DCs therapy in human PC in 2007. Five patients with locally advanced PC were treated with gemcitabine and biweekly with EUS-guided injection of immature DCs. One patient showed a partial tumor response and two other patients showed stable disease symptoms for over 6 months. Irisawa et al. reported seven patients with unresectable PC refractory to gemcitabine. Patients received intratumoral injection of 10 billion or more immature DCs at two to three sites using EUS-FNI. No complication associated with EUS-FNI was found. Celiac artery (CA)19-9 levels decreased in three patients. Hirooka et al. performed a pilot trial of combination therapy of gemcitabine with OK432-pulsed DCs in five patients with advanced PC. One patient showed a partial response and two patients exhibited sustained stable disease symptoms for over 6 months. Soeda et al. suggested that regular doses of gemcitabine induce an increase in CD14+ monocytes and CD11c+ DCs in patients with advanced PC. TNFerade is a replication-deficient adenovirus vector carrying the human tumor necrosis factor-alpha gene regulated by a radiation-inducible promoter (Egr-1). Hecht et al. reported a phase I/II study of EUS or percutaneous transabdominal delivery of TNFerade with chemoradiation in 50 patients with PC. TNFerade was injected into locally advanced pancreatic carcinomas using EUS-FNI or percutaneous administration. Patients also received 50.4 Gy radiation and 5-FU 200 mg/m 2 daily for 5.5 week. One, three and 12 patients showed a complete response, partial response and stable disease symptoms, respectively. Seven patients eventually underwent surgery, six showed clear margins and three survived >24 month. Gemcitabine offers a modest improvement over 5-fluorouracil in patients with unresectable PC and in the adjuvant setting, post-curative resection. Levy et al. reported EUS-FNI of gemcitabine in 36 patients with unresectable PC. Patients underwent EUS-FNI with gemcitabine (40 mg/mL) and for 4-14 day. Survival at 6 months and 1 year was 76% and 46%, respectively. Three patients initially deemed unresectable were down staged and underwent R0 resection. OncoGel (ReGel/paclitaxel) is an intralesional injectable formulation of the chemotherapeutic drug paclitaxel used for local tumor management. In a porcine model, Matthes et al. performed a pilot trail of EUS-guided FNI of Oncogel into the pancreas. Eight pigs underwent injection of 1, 2, 3, or 4 mL OncoGel. All animals tolerated the procedure and showed no clinical signs of pancreatitis or intra-abdominal infection. After 14 days, significant tissue concentrations of paclitaxel were clinically detected at a distance of 30-50 mm from the injection sit in animals that underwent an injection of 3 and 4 mL of the agent. ONYX-015 is an E1B 55 kDa gene-deleted replication-selective adenovirus that preferentially replicates in malignant cells, leading to cell death. A phase I/II trial of injection of ONYX-015 was performed in 21 patients with PC under EUS guidance. The FNI protocol consisted of 1 mL of virus per injection, with up to 10 injections per session depending on the tumor size, for a total of eight sessions over 8 week. The four final treatments were given in combination with gemcitabine (intravenous, 1000 mg/m 2 ). After 8 week, two patients showed partial regression, two had minor responses, six had stable disease symptoms and 11 either showed progressive disease symptoms or had to leave the study because of treatment toxicity. RFA is a well-established technique used to ablate neoplastic tissues by local thermal-induced coagulative necrosis of the tumor. However, recent retrospective and prospective studies have shown the feasibility of monopolar RFA in patients with stage III PC in the open, percutaneous, or laparoscopic setting. , Considering that EUS allows real-time imaging to reach deeply located targets, EUS-guided RFA may be more suitable for PC. Until date, five studies on the feasibility, safety and effect of EUS-guided RFA have been reported. Goldberg et al. initially described EUS-RFA in an animal model. In pigs immediately killed 1-2 d after ablation, well-demarcated spherical foci of coagulation necrosis measuring 8-12 mm in diameter were surrounded by a 1-2 mm rim of hemorrhage. Kim et al. used an 18-gauge endoscopic RFA electrode to puncture the body and tail of the pancreas with an output power of 50 W for 5 min. The mean diameter of the ablated tissue was 23.0 ΁ 6.9 mm. Slight complications were observed, including intestinal wall adhesions and retroperitoneal fibrosis located in adjacent organs. Gaidhane et al. evaluated the feasibility and safety of EUS-FNI RFA of the pancreas head through a 19-gauge needle. In three of the five pigs, the proximal pancreas showed greater levels of tissue injury than the distal pancreas, consistent with the proximity of the tissue to the procedure site. These results indicate that EUS-RFA is a safe and effective method to produce discrete zones of coagulation necrosis with acceptable complications. Under EUS guidance, cryotherm probe (CTP), a flexible bipolar device that combines radiofrequency with cryogenic cooling, was used to treat patients with unresectable stage III pancreatic adenocarcinoma with fixed RF power (heating) of 18 W and fixed pressure (cooling) of 650 psi [Figure 1]b.  CTP was successfully applied under EUS guidance in 72.8% of patients and no severe complications or deaths related to the procedure were observed. CT scan clearly defined the tumor margins in only 6 of 16 patients after ablation. In these patients, the tumor appeared smaller compared with the initial mass. The next step is to design large clinical trials to determine the feasibility and safety of EUS-RFA and demonstrate progression-free survival and local control. A phase I study of PDT for PC demonstrated that it can produce necrosis in PC with acceptable morbidity. Chan et al. assessed the feasibility and safety of EUS-guided intervention. Localized tissue necrosis was achieved in all organs without significant complications. PDT can cause a focal necrotic area of 3.6 mm 2 after each application of light (50 J/cm for 120 s); thus, a lesion with a diameter of 10 mm and a wall thickness of 1 mm could be ablated by three light exposures. EUS-PDT with verteporfin indicates that the diameter of the necrotic tissue was directly related to the dose of light. CT imaging results demonstrated that the mean diameters of the lesion after 10, 15 and 20 min of laser light exposure are 6.6, 9.4 and 26.3 mm, respectively. Upon gross pathological examination, the mean diameters of the pancreatic necrotic lesion were 15, 24 and 30.5 mm, respectively. No post-procedural complications were observed. PDT appears to be suitable for small PC. Evaluating the efficacy, feasibility and safety of EUS-guided PDT for human PC is important. In addition, further studies are necessary to determine a standard photosensitive drug. The relative biological effectiveness of 125 I seeds in PC cells has yet to be determined. Wang et al. found that continuous low-dose-rate irradiation by 125 I seeds can cause Panc-1 cell cycle arrest in the G2/M phase and is more effective in inducing cell apoptosis of Panc-1 cells than an acute high-dose-rate of 60 Co irradiation. In a porcine model, Sun et al. inserted an 18-gauge therapeutic needle into the target site under EUS guidance. The stylet was removed to easily insert the seeds into the pancreas through the needle channel. All the seeds were successfully implanted without significant complications. The researchers firstly reported that radioactive seed implantation is a safe, simple and minimally invasive technique for interstitial brachytherapy of the pancreas. Subsequently, Sun et al. performed EUS-guided 125 I implantation in 15 patients with unresectable PC, including eight patients with stage III disease and seven patients with stage IV disease. After a median follow-up period of 10.6 months, the objective tumor response for 22 radioactive seeds was classified as "partial" in 27% of the patients, "minimal" in 20% of the patients and indicative of "stable disease" in 33% of the patients. With routine gemcitabine-based 5-FU chemotherapy 1 week after brachytherapy, Jin et al. further evaluated the clinical efficacy and safety of EUS-guided implantation of radioactive 125 I seeds in advanced PC [Figure 1]c. During the 4-week period, 3 cases (13.6%) achieved partial remission and the disease in 10 patients (45.5%) remained stable. Moreover, visual analog scale (VAS) pain scores significantly decreased from 5.07 to 1.73 about 1 week after brachytherapy and were maintained for 1 month. No obvious complications were observed following cancer therapy. Compared with single brachytherapy as reported by Sun et al.,  the combination of chemotherapy and radioactive 125 I seeds did not demonstrate better tumor responses or long-term effects. The next step in this field of study is to conduct randomized controlled trials with long-term follow-up to evaluate differences in efficacy between single EUS-guided implantation and single standardized chemotherapy. SBRT techniques rely on image-guided radiotherapy (IGRT) to allow radiation dose escalation to tumors while simultaneously minimizing the dose to surrounding normal tissue through the use of radiographic imaging to verify target delineation and treatment delivery. Prospective phase I and phase II studies , and two retrospective studies , show that SBRT is a safe and effective approach for treating patients with PC. In addition, hypofractionated SBRT can be effectively delivered with acceptable side effects and minimal interference to gemcitabine chemotherapy. Fiducial markers are useful to facilitate quantification of respiratory-associated tumor motion and allow reproducible daily treatment delivery. Fiducial markers include radiopaque spheres, coils, or seeds that are implanted in or near the tumor. EUS-guided fiducial placement has been reported in recent years to facilitate SBRT for patients with PC. Park et al. and Sanders et al. determined the safety, feasibility and limitations of EUS-guided fiducial placement by a 19-gauge needle for locally advanced PC [Figure 1]d. Fiducial placement was successfully placed in 88% to 90% of the cases. No serious complications were observed. Minor complications (3%-5%) included mild pancreatitis and minor bleeding. Limitations to EUS-guided fiducial placement may include surgically altered anatomy in patients with recurrent PC. Varadarajulu et al. also reported that EUS-guided fiducial markers for delivering IGRT were successfully performed in nine patients and no complications were encountered. On follow-up CT imaging, three of the patients who had positive tumor margins at surgery were well without any evidence of the disease. One patient showed a decrease in tumor size and one patient had curative surgery. Two patients had stable disease symptoms with undergoing radiation therapy and two patients showed an increase in tumor size. Khashab et al. completed a comparative analysis of traditional fiducials (TFs) (5 mm length and 0.8 mm diameter) and visicoil fiducials (VFs) (10 mm length and 0.35 mm diameter) implanted under EUS guidance. The median visibility score for TFs was significantly better than that for VFs. The mean migration was not significantly different between the two types of fiducials. As such, the researchers recommended the placement of TFs whenever possible. If this approach fails, changing to a 22-gauge needle and VFs is advisable. Conducting randomized controlled trials with long-term follow-up to compare the efficacy between single EUS-guided SBRT and single standardized chemotherapy must be carried out in future studies. Under EUS guidance with a 19-gauge fine needle, a neodymium: Yttrium aluminum garnet (Nd:YAG) laser at 1.064 nm with an output power of 2 and 3 W and a total delivered energy of 500 and 1000 J was inserted into the pancreatic tail. Tissue necrosis was observed in all animals on histological examination. The mean ablation area ranged from 49 mm  to 80 mm  . No major complications, defined as clinically symptomatic and chemistry-proven pancreatitis with peritonitis, were observed. The next step is to thoroughly examine the safety and feasibility of EUS-guided Nd:YAG laser ablation for PC through clinical trials. Overall, EUS-guided therapeutic strategies do not seem to achieve the desired results in pancreatic tumor killing. The survival time of the majority of the treated patients was not significantly prolonged. However, the disease became stable in some patients subjected to EUS-guided treatment and some PCs initially deemed unresectable could even be removed afterward. These results encourage us to continue to explore EUS-guided therapeutic strategies in PC applications. With regard to the antitumor agent delivery, gemcitabine and TNFerade injection guided by EUS seems to show relatively beneficial effects. Gemcitabine combined with DC injection has bright prospects in future cancer treatment. Clinical trials of EUS-guided brachytherapy show a certain effect in PC treatment. However, the majority of these associated studies were conducted in China; thus, the technique must be further validated world-wide. RFA and SBRT seem to be more suitable for small PC than large PC due to the limitation of the location of the pancreas. Laser ablation and PDT studies remain in the animal experiment stage and their clinical effects must be further verified. Combined chemotherapy and interventional EUS treatment may indicate the future direction of PC treatment. Neurons that innervate the pancreas can receive nociceptive stimulation and transmit this pain information to the celiac plexus. Celiac neurolysis, which refers to the permanent destruction of nerve endings using phenol- and alcohol-based solutions, may inhibit the ascending pain information. EUS-guided techniques described for performing CN include CPN [Figure 2]A, celiac ganglia neurolysis (CGN) [Figure 2]B and broad plexus neurolysis (BPN). Gunaratnam et al. studied 58 patients with pain secondary to inoperable PC and assessed the efficacy of EUS-guided CPN. Under EUS guidance, 3-6 mL (0.25%) of bupivacaine and 10 mL (98%) of alcohol were injected into both sides of the celiac trunk [Table 3]. The pain scores were significantly lower 2 week after the procedure. This effect was sustained for 24 week when adjusted for morphine use and adjuvant therapy. However, only 31 cases (54%) experienced a decline of 3 points or more. No major complications were observed. Iwata et al. recently published a retrospective study of EUS-CPN in 47 patients with unresectable PC or non-pancreatic abdominal cancer. EUS-CPN was successful in 32 patients (68.1%). Of these patients, 14 cases obtained complete pain relief. Multivariate analysis showed that direct invasion of the celiac plexus and distribution of ethanol only on the left side of the CA was significant factors for a negative response to EUS-CPN. Wyse et al. found that pain relief was greater in the EUS-CPN group than in the control group at 1 month and significantly greater at 3 months. Thus, the authors concluded that early EUS-CPN provides better pain relief and may prevent progressive increases in morphine consumption compared with conventional management. During EUS diagnosis and staging for advanced PC, while it does not prolong overall survival, early EUS-CPN was recommended to achieve better quality-of-life. Given the suboptimal degree and duration of pain relief provided by EUS-CPN, some clinicians believed that diffuse injection into the celiac ganglia may increase the efficacy of the technique. The rate of ganglia detection varies based on the instrument used (radial EUS 79.2% vs. linear EUS 85.6%) and among endosonographers (65% to 97%). Levy et al. 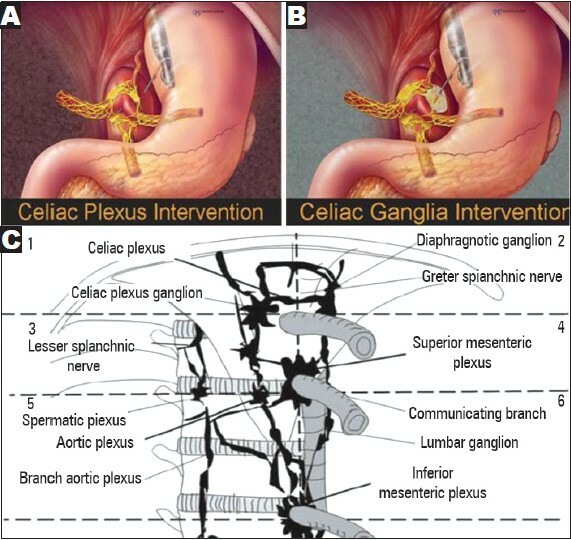 regarded the following features as celiac ganglia: (a) Location lateral to the celiac artery, (b) similar echogenicity to the left adrenal, (c) irregular margins, (d) central echo-rich foci and (e) echo-poor threads extending from or connecting the structures. Only two studies published in non-abstract form have evaluated EUS-guided CGN in patients with PC. Levy et al. established that drugs for CGN are sequentially injected, beginning with bupivacaine (0.25 mL) followed by alcohol (99%). Among 17 patients with PC, 16 reported partial relief and none experienced complete pain relief. Narcotic use increased in two patients, remained equivalent in 13 patients and decreased in three patients. Seven patients experienced "initial" pain exacerbation lasting a mean duration of 2.2 days. The study of Ascunce et al. retrospectively evaluated the efficacy of EUS-CN in 64 patients with PC, including EUS-CGN (n = 40) and standard bilateral EUS-CPN (n = 24). At week 1, 32 patients (50%) showed a symptomatic response, which is defined as a drop of ned points in pain with subjective pain improvement and no increase in narcotic dosage. Pain relief was reported in 26 of 40 (65%) and 6 of 24 (25%) patients undergoing CGN and CPN, respectively. This study directly showed that visualization and injection of alcohol into the celiac ganglia is superior to bilateral injection at the celiac trunk. All regions containing the celiac, superior and inferior mesenteric arteries could be divided on the frontal plane into six areas: Upper right and left (upper CA), middle right and left (between the CA and the superior mesenteric artery [SMA]) and lower right and left (between the SMA and inferior mesenteric artery) [Figure 2]C. Sakamoto et al. compared the effectiveness of standard EUS-CPN and EUS-BPN using a 22-gauge needle and a 25-gauge needle, respectively, that extended over the SMA. Significantly better short-term and long-lasting pain relief in patients with contrast in six areas and five areas in the EUS-BPN group was observed compared with that in the EUS-CPN group. Conversely, the percentage of patients with contrast in just one, two, three, or four areas was higher in the EUS-CPN group than in the EUS-BPN group. A significantly greater decrease in VAS scores on days 7 and 30 was observed between the EUS-BPN group and the EUS-CPN group. EUS-BPN using a 25-gauge needle may be more effective than standard EUS-CPN for patients with advanced abdominal cancer-related abdominal pain because of the broader neurotic region without incurring serious complications. Wang et al. recently evaluated the feasibility and safety of EUS-guided radiation of the celiac ganglia with 125 I seeds in a porcine model. No severe complications in any animal and no damage to the surrounding organs were observed. On day 60 after the procedure, apoptotic indices in the ganglia were 0.53 and 0.94 in the 0.4 and 0.8 mCi groups, respectively. Both brachytherapy groups exhibited neuronal apoptosis in the ganglion and the intensity of necrosis increased with the increase in radiation dose. By contrast, no apoptotic cells were found in the control group implanted with blank seeds. Subsequently, Wang et al. performed a prospective pilot study in which consecutive patients who had moderate to severe pain resulting from biopsy-proven unresectable PC enrolled. 2 weeks later, the VAS scores (6.09 vs. 4.48) and mean analgesic consumption (71.74 mg vs. 55.22 mg) of the patients were significantly less than the pre-operative values. 5 months after the procedure, 50% of the patients continued to show partial pain relief. No patient experienced complete pain relief in this study. Further clinical trials must be carried out to validate the safety and long-term effectiveness of this new approach in pain management relative to conventional techniques. In general, EUS-CN diminished PC pain in approximately 60% of the patients during the first 1-4 weeks after therapy. Early EUS-CPN allows patients to achieve a better quality-of-life and does not increase the narcotic dosage. The efficacy of EUS-BPN and EUS-CGN is superior to that of EUS-CPN. In contrast to EUS-CN, EUS-guided 125 I seed implantation induces better long-lasting pain relief. Well-designed trials are necessary to compare the efficacy and safety of CN and EUS-guided 125 I seed implantation and select the optimal approach for controlling pain associated with PC. This paper is supported by National Natural Science Foundation of China, No. 81071982. 1. Ferlay J, Shin HR, Bray F, et al. Estimates of worldwide burden of cancer in 2008: GLOBOCAN 2008. Int J Cancer 2010; 127: 2893-917. 2. Ferlay J, Shin HR, Bray F, et al. GLOBOCAN 2008, Cancer Incidence and Mortality Worldwide: IARC Cancer Base No. 10. Lyon: International Agency for Research on Cancer; 2010. Available from: http://www.globocan.iarc.fr. Accessed May 2011. 3. Warshaw AL, Gu ZY, Wittenberg J, et al. Preoperative staging and assessment of resectability of pancreatic cancer. Arch Surg 1990; 125: 230-3. 4. Büchler MW, Werner J, Weitz J. R0 in pancreatic cancer surgery: Surgery, pathology, biology, or definition matters? Ann Surg 2010; 251: 1011-2. 5. Greenlee RT, Hill-Harmon MB, Murray T, et al. Cancer statistics, 2001. CA Cancer J Clin 2001; 51: 15-36. 6. Du YQ, Li ZS, Jin ZD. Endoscope-assisted brachytherapy for pancreatic cancer: From tumor killing to pain relief and drainage. J Interv Gastroenterol 2011; 1: 23-7. 7. Chang KJ, Nguyen PT, Thompson JA, et al. Phase I clinical trial of allogeneic mixed lymphocyte culture (cytoimplant) delivered by endoscopic ultrasound-guided fine-needle injection in patients with advanced pancreatic carcinoma. Cancer 2000; 88: 1325-35. 8. Nonogaki K, Hirooka Y, Itoh A, et al. Combined treatment with immunotherapy and chemotherapy using endoscopic ultrasonography: A phase 1 trial as first line treatment in patients with locally advanced pancreatic carcinoma. Gastrointest Endosc 2007; 65: AB207. 9. Irisawa A, Takagi T, Kanazawa M, et al. Endoscopic ultrasound-guided fine-needle injection of immature dendritic cells into advanced pancreatic cancer refractory to gemcitabine: A pilot study. Pancreas 2007; 35: 189-90. 10. Hirooka Y, Itoh A, Kawashima H, et al. A combination therapy of gemcitabine with immunotherapy for patients with inoperable locally advanced pancreatic cancer. Pancreas 2009; 38: e69-74. 11. Hecht JR, Farrell JJ, Senzer N, et al. EUS or percutaneously guided intratumoral TNFerade biologic with 5-fluorouracil and radiotherapy for first-line treatment of locally advanced pancreatic cancer: A phase I/II study. Gastrointest Endosc 2012; 75: 332-8. 12. Levy MJ, Alberts SR, Chari ST, et al. EUS guided intra-tumoral gemcitabine therapy for locally advanced and metastatic pancreatic cancer. Gastrointest Endosc 2011; 73: AB144-5. 13. Hecht JR, Bedford R, Abbruzzese JL, et al. A phase I/II trial of intratumoral endoscopic ultrasound injection of ONYX-015 with intravenous gemcitabine in unresectable pancreatic carcinoma. Clin Cancer Res 2003; 9: 555-61. 14. Arcidiacono PG, Carrara S, Reni M, et al. Feasibility and safety of EUS-guided cryothermal ablation in patients with locally advanced pancreatic cancer. Gastrointest Endosc 2012; 76: 1142-51. 15. Sun S, Xu H, Xin J, et al. Endoscopic ultrasound-guided interstitial brachytherapy of unresectable pancreatic cancer: Results of a pilot trial. Endoscopy 2006; 38: 399-403. 16. Jin Z, Du Y, Li Z, et al. Endoscopic ultrasonography-guided interstitial implantation of iodine 125-seeds combined with chemotherapy in the treatment of unresectable pancreatic carcinoma: A prospective pilot study. Endoscopy 2008; 40: 314-20. 17. Park WG, Yan BM, Schellenberg D, et al. EUS-guided gold fiducial insertion for image-guided radiation therapy of pancreatic cancer: 50 successful cases without fluoroscopy. Gastrointest Endosc 2010; 71: 513-8. 18. Sanders MK, Moser AJ, Khalid A, et al. EUS-guided fiducial placement for stereotactic body radiotherapy in locally advanced and recurrent pancreatic cancer. Gastrointest Endosc 2010; 71: 1178-84. 19. Varadarajulu S, Trevino JM, Shen S, et al. The use of endoscopic ultrasound-guided gold markers in image-guided radiation therapy of pancreatic cancers: A case series. Endoscopy 2010; 42: 423-5. 20. Khashab MA, Kim KJ, Tryggestad EJ, et al. Comparative analysis of traditional and coiled fiducials implanted during EUS for pancreatic cancer patients receiving stereotactic body radiation therapy. Gastrointest Endosc 2012; 76: 962-71. 21. Soeda A, Morita-Hoshi Y, Makiyama H, et al. Regular dose of gemcitabine induces an increase in CD14+ monocytes and CD11c+ dendritic cells in patients with advanced pancreatic cancer. Jpn J Clin Oncol 2009; 39: 797-806. 22. Oettle H, Post S, Neuhaus P, et al. Adjuvant chemotherapy with gemcitabine vs observation in patients undergoing curative-intent resection of pancreatic cancer: A randomized controlled trial. JAMA 2007; 297: 267-77. 23. Matthes K, Mino-Kenudson M, Sahani DV, et al. EUS-guided injection of paclitaxel (OncoGel) provides therapeutic drug concentrations in the porcine pancreas (with video). Gastrointest Endosc 2007; 65: 448-53. 24. Carrara S, Arcidiacono PG, Albarello L, et al. Endoscopic ultrasound-guided application of a new hybrid cryotherm probe in porcine pancreas: A preliminary study. Endoscopy 2008; 40: 321-6. 25. Wu Y, Tang Z, Fang H, et al. High operative risk of cool-tip radiofrequency ablation for unresectable pancreatic head cancer. J Surg Oncol 2006; 94: 392-5. 26. Spiliotis JD, Datsis AC, Michalopoulos NV, et al. High operative risk of cool-tip radiofrequency ablation for unresectable pancreatic head cancer. J Surg Oncol 2007; 96: 89-90. 27. Goldberg SN, Mallery S, Gazelle GS, et al. EUS-guided radiofrequency ablation in the pancreas: Results in a porcine model. Gastrointest Endosc 1999; 50: 392-401. 28. Kim HJ, Seo DW, Hassanuddin A, et al. EUS-guided radiofrequency ablation of the porcine pancreas. Gastrointest Endosc 2012; 76: 1039-43. 29. Gaidhane M, Smith I, Ellen K, et al. Endoscopic ultrasound-guided radiofrequency ablation (EUS-RFA) of the pancreas in a porcine model. Gastroenterol Res Pract 2012; 2012: 431451. 30. Chatlani PT, Nuutinen PJ, Toda N, et al. Selective necrosis in hamster pancreatic tumours using photodynamic therapy with phthalocyanine photosensitization. Br J Surg 1992; 79: 786-90. 31. Bown SG, Rogowska AZ, Whitelaw DE, et al. Photodynamic therapy for cancer of the pancreas. Gut 2002; 50: 549-57. 32. Fan BG, Andrén-Sandberg A. Photodynamic therapy for pancreatic cancer. Pancreas 2007; 34: 385-9. 33. Chan HH, Nishioka NS, Mino M, et al. EUS-guided photodynamic therapy of the pancreas: A pilot study. Gastrointest Endosc 2004; 59: 95-9. 34. Pungpapong S, Noh KW, Raimondo M. Interventional endosonography for pancreatic cancer. JOP 2006; 7: 441-6. 35. Yusuf TE, Matthes K, Brugge WR. EUS-guided photodynamic therapy with verteporfin for ablation of normal pancreatic tissue: A pilot study in a porcine model (with video). Gastrointest Endosc 2008; 67: 957-61. 36. Wang J, Wang J, Liao A, et al. The direct biologic effects of radioactive 125I seeds on pancreatic cancer cells PANC-1, at continuous low-dose rates. Cancer Biother Radiopharm 2009; 24: 409-16. 37. Sun S, Qingjie L, Qiyong G, et al. EUS-guided interstitial brachytherapy of the pancreas: A feasibility study. Gastrointest Endosc 2005; 62: 775-9. 38. Koong AC, Christofferson E, Le QT, et al. Phase II study to assess the efficacy of conventionally fractionated radiotherapy followed by a stereotactic radiosurgery boost in patients with locally advanced pancreatic cancer. Int J Radiat Oncol Biol Phys 2005; 63: 320-3. 39. Koong AC, Le QT, Ho A, et al. Phase I study of stereotactic radiosurgery in patients with locally advanced pancreatic cancer. Int J Radiat Oncol Biol Phys 2004; 58: 1017-21. 40. Didolkar MS, Coleman CW, Brenner MJ, et al. Image-guided stereotactic radiosurgery for locally advanced pancreatic adenocarcinoma results of first 85 patients. J Gastrointest Surg 2010; 14: 1547-59. 41. Rwigema JC, Parikh SD, Heron DE, et al. Stereotactic body radiotherapy in the treatment of advanced adenocarcinoma of the pancreas. Am J Clin Oncol 2011; 34: 63-9. 42. Mahadevan A, Jain S, Goldstein M, et al. Stereotactic body radiotherapy and gemcitabine for locally advanced pancreatic cancer. Int J Radiat Oncol Biol Phys 2010; 78: 735-42. 43. Di Matteo F, Martino M, Rea R, et al. EUS-guided Nd:YAG laser ablation of normal pancreatic tissue: A pilot study in a pig model. Gastrointest Endosc 2010; 72: 358-63. 44. Grahm AL, Andrén-Sandberg A. Prospective evaluation of pain in exocrine pancreatic cancer. Digestion 1997; 58: 542-9. 45. Michaels AJ, Draganov PV. Endoscopic ultrasonography guided celiac plexus neurolysis and celiac plexus block in the management of pain due to pancreatic cancer and chronic pancreatitis. World J Gastroenterol 2007; 13: 3575-80. 46. Wang K, Jin Z, Du Y, et al. Evaluation of endoscopic-ultrasound-guided celiac ganglion irradiation with iodine-125 seeds: A pilot study in a porcine model. Endoscopy 2009; 41: 346-51. 47. Gunaratnam NT, Sarma AV, Norton ID, et al. A prospective study of EUS-guided celiac plexus neurolysis for pancreatic cancer pain. Gastrointest Endosc 2001; 54: 316-24. 48. Iwata K, Yasuda I, Enya M, et al. Predictive factors for pain relief after endoscopic ultrasound-guided celiac plexus neurolysis. Dig Endosc 2011; 23: 140-5. 49. Wyse JM, Carone M, Paquin SC, et al. Randomized, double-blind, controlled trial of early endoscopic ultrasound-guided celiac plexus neurolysis to prevent pain progression in patients with newly diagnosed, painful, inoperable pancreatic cancer. J Clin Oncol 2011; 29: 3541-6. 50. Levy MJ, Topazian MD, Wiersema MJ, et al. Initial evaluation of the efficacy and safety of endoscopic ultrasound-guided direct Ganglia neurolysis and block. Am J Gastroenterol 2008; 103: 98-103. 51. Ascunce G, Ribeiro A, Reis I, et al. EUS visualization and direct celiac ganglia neurolysis predicts better pain relief in patients with pancreatic malignancy (with video). Gastrointest Endosc 2011; 73: 267-74. 52. Sakamoto H, Kitano M, Kamata K, et al. EUS-guided broad plexus neurolysis over the superior mesenteric artery using a 25-gauge needle. Am J Gastroenterol 2010; 105: 2599-606. 53. Wang KX, Jin ZD, Du YQ, et al. 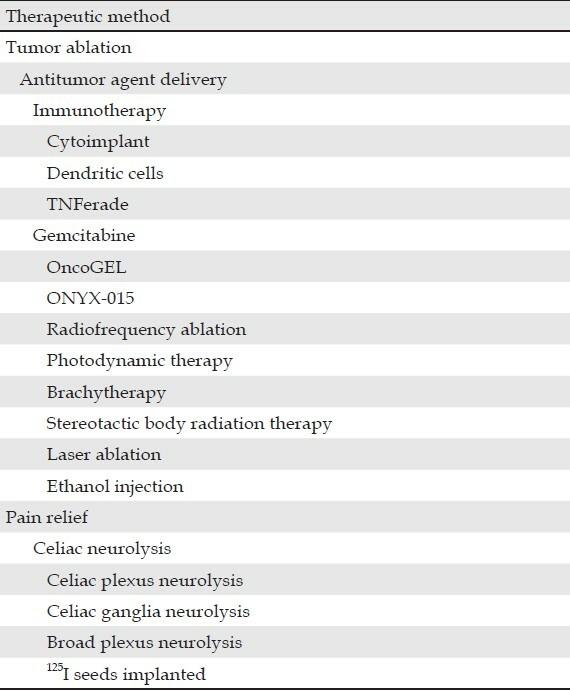 EUS-guided celiac ganglion irradiation with iodine-125 seeds for pain control in pancreatic carcinoma: A prospective pilot study. Gastrointest Endosc 2012; 76: 945-52. 54. Levy MJ, Chari ST, Wiersema MJ. Endoscopic ultrasound-guided celiac neurolysis. Gastrointest Endosc Clin N Am 2012; 22: 231-47, viii. 55. Levy M, Rajan E, Keeney G, et al. Neural ganglia visualized by endoscopic ultrasound. Am J Gastroenterol 2006; 101: 1787-91. 56. Lin YS, Jen YM, Lin JC. Radiation-related cranial nerve palsy in patients with nasopharyngeal carcinoma. Cancer 2002; 95: 404-9. 57. Bajrovic A, Rades D, Fehlauer F, et al. Is there a life-long risk of brachial plexopathy after radiotherapy of supraclavicular lymph nodes in breast cancer patients? Radiother Oncol 2004; 71: 297-301.